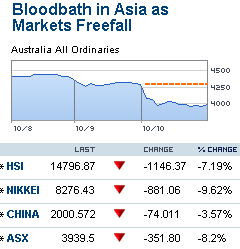 There must be a lot of fear in the market currently as all major indexes around the world are seeing red. And I thought that the ASX would hold strong well above 4500 points, and see where it’s currently after this closing week – It’s below 4000! It was still as high as 6500 points when it reach its highest point ever back last year. Consumer confidence? Investor confidence? They all went out of the window. When commodities price went free fall, so did ASX as we all know that Australia has been having a nice run due to demand for mining commodities from China. It will be really interesting to see where this will be leading us to over the coming weeks.